Scenic Panel IV tapestry shows a beautiful garden fountian scene with flowers. 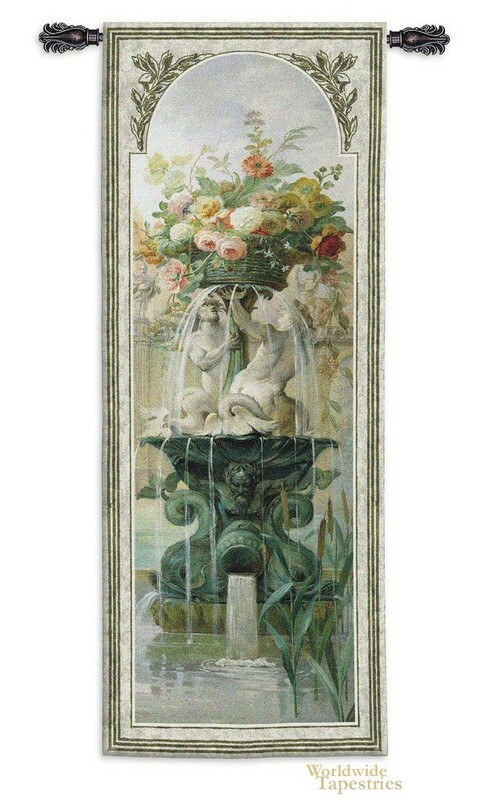 Here in this garden and fountain tapestry we see a gorgeous cherub fountain in white and emerald green, with water pouring onto the pond below. The fountain is decorated with an assortment of flowers in a variety of shades of pinks, yellows and reds. Reeds and water plants are seen in the pond in the foreground. The work makes ingenious use of light and color, with a misty distance which evokes a sense of romanticism and fantasy, as this work stirs both our senses and imagination as we are drawn into the world which this scene lives. Like its sister work, Scenic Panel II, this tapestry is a celebration of the beauty of nature and gardens. Scenic Panel IV tapestry is backed with lining and tunnel for easy hanging. Note: tapestry rod and tassels, where pictured, are not included in the price. Dimensions: W 31" x H 79"